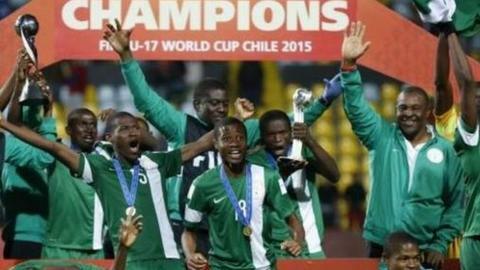 Nigeria's Under-17 team returned home on Wednesday to a rapturous reception after their World Cup success in Chile. Thousands were at Abuja's international airport to greet the team, who beat Mali 2-0 in Sunday's final. Fans cheered and hugged the Golden Eaglets players and officials, who also posed for pictures with supporters. "It gives us great joy to see Nigerians come out in big numbers to celebrate the team's success," coach Emmanuel Amuneke told BBC Sport. "Football is a powerful force and the win in Chile shows how successful we can be as a nation if we all work together for a common goal. "We thank everyone for a great welcome and their incredible support during and after the tournament." Players and officials were driven round the Federal Capital Territory in a motorcade before the convoy arrived at the Transcorp Hilton Hotel. The squad had dinner with the country's new sports minister Solomon Dalong on Wednesday night at the hotel. They are expected to reconvene for a presidential reception with president Muhamadu Buhari on a date yet to be announced. The Golden Eaglets not only successfully defended their crown in Chile, they also took centre stage when it came to the individual honours. Captain Kelechi Nwakali made his mark on the competition by winning the Golden Ball as the tournament's best player. His three goals and three assists also earned him the bronze boot as the third highest scorer. With 10 goals - a new tournament record - striker Victor Osimhen won the golden boot as well as the silver ball as the competition's second best player.